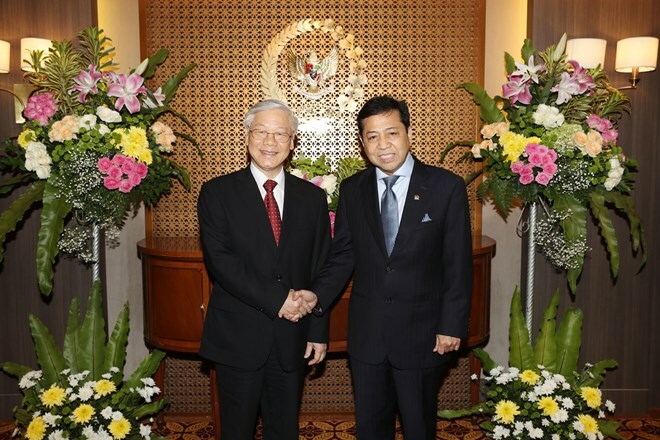 Jakarta (VNA) – Speaker of the People’s Representative Council of Indonesia Setya Novanto met with Vietnam’s Party General Secretary Nguyen Phu Trong on August 22, noting that his country attaches importance to enhancing the friendship and multifaceted cooperation with Vietnam. Welcoming the Vietnamese leader’s official visit, Novanto expressed his admiration for the country’s struggle for national independence while valuing its enormous achievements over the three decades of reforms, especially in spurring economic growth, maintaining political and social stability, and improving people’s living standards. General Secretary Trong noted his good impression of Indonesia and recalled the memories between late Presidents Ho Chi Minh and Sukarno. He congratulated Indonesia on major attainments in all aspects, voicing his belief that Indonesian people will continue to obtain more accomplishments in the time ahead. The two sides shared the view that both Vietnam and Indonesia play important roles in ASEAN. They are trustworthy partners of each other and share many similar interests and viewpoints. The countries should expand relations via the channels of Parties, Governments, parliaments and people’s organisations, thus helping to reinforce their traditional friendship and strategic partnership, the leaders said. They agreed to boost bilateral trade to 8 billion USD in 2018 and 10 billion USD in the near future. At the meeting, General Secretary Trong and Speaker Novanto highly valued the comprehensive, positive and effective relationship between the National Assembly of Vietnam and the People’s Representative Council of Indonesia. Both sides need to step up cooperation in all spheres, including increasing delegation exchanges between their subordinate committees and enhancing activities of parliamentary friendship groups, so as to foster cooperation and experience sharing between the two legislative bodies. They should also step up information exchange, close coordination and mutual support at international and regional forums such as the Inter-Parliamentary Union (IPU), the ASEAN Inter-Parliamentary Assembly, and the Asia Pacific Parliamentary Forum, the leaders added. Party General Secretary Trong said he hopes the People’s Representative Council of Indonesia and the National Assembly of Vietnam, as the representative agencies of the two countries’ people, will have more active contributions to the bilateral friendship, multifaceted cooperation and strategic partnership. On this ocassion, he delivered an invitation to visit Vietnam from National Assembly Chairwoman Nguyen Thi Kim Ngan to Speaker Novanto, who accepted the invitation with pleasure.